This was taken in March, and Alessandra (2nd from the right) was due in June. Yesterday we went back out to brunch. 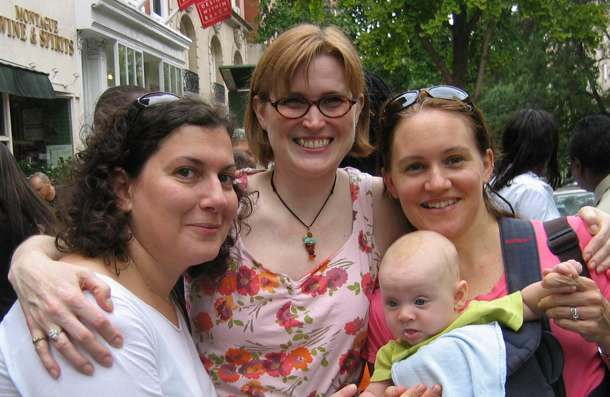 By the way, someone asked when we went out to brunch last and I said, “Last summer,” meaning 2006. “Weren’t we all bundled up?” They asked. “I don’t think so” I answered. “Maybe light jackets?” Here is the evidence, of when we went and the further deterioration of my brain. This was taken yesterday, in front of the same restaurant. That’s Dimitra, Mary, Alessandra and a brand new human human being named Ella. Oh yeah, and I said “last summer” with little Ella right next to me, which would make her almost a year and a half old which she clearly isn’t. I think Ella is taking this whole “I didn’t exist a little while ago and now here I am, please explain EVERYTHING to me” thing rather well. It was great meeting Miss Ella–she is a wonderful addition to the brunch babes! I love her laugh and how she fell asleep right after a good bottle, head back and all. Napping is a great skill (which she may not appreciate until later in life)!